Established in 1980 by 30-year professional rigger Charles Russell, New England Yacht Rigging has serviced boats from dinghy class to the America's Cup. We provide standing and running rigging, spars, deck hardware, jib and mainsail furling systems, lifelines and just about everything "from the deck up"! We have 5,000 different items in inventory including a full line of hardware, custom rigging, and a large selection of marine cordage. Our goal is to help you enjoy your sailing and boating experience whether, you are interested in a leisurely afternoon sail or a highly competitive "white knuckle" race. Our riggers are certified in splicing from New England Ropes and Yale Cordage. We are a certified Regional Selden Mast Center and an authorized Selden dealer. We splice all types of rope: double braid, 3 strand, rope to wire, rope to chain and all the high tech fibers, such as, Zylon (PBO), Vectran, Spectra/Dyneema, Technora and Kevlar. 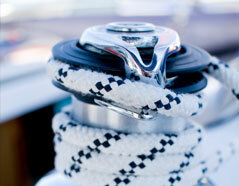 We also provide custom splicing for some of the big name marine catalogue companies and manufacturers. We have the capacity to swage up to ½" 1x19 stainless steel cable and head up to -40 Nitronic 50 rod for standing rigging. We also provide coated Kevlar standing rigging. Should you need a mast or boom, we can design it specifically for your boat. Often, we are able to provide the original extrusion if is currently available. Within our locale, we also provide mobile and dockside service. "Two years ago I participated in the Bermuda One/Two. Although I was keen on the competitive aspect of the race my primary goal was to make it to Bermuda and back safely. I relied on New England Yacht Rigging to ensure I met my goal. They replaced all of my life lines, running rigging and gave my mast an overall inspection." "When I decided to finally move up to a 40 footer my budget only allowed me to purchase an older boat. I did most of the work myself but when it came to replacing rigging and deck hardware I met with the team at New England Yacht rigging to review my needs and budget. They were fantastic to deal with as they understood my need for quality, but at a price I could afford."